Sona’s efforts to save her marriage have not gone to waste. Sunaina continues attempting to create a rift between Sona and Kanhaiya. Julli is shocked to finally find out who she has been speaking with online. The police inform Kanhaiya that Sona has laid a complaint against her mother-in-law, Sunaina. Neelum sees Julli with Avinash and immediately notices that there is something between them. After being disciplined by Neelum, Julli makes a drastic decision. Kanhaiya finds evidence that could prove Sona guilty. Kanhaiya realises that someone is trying to drive a wedge between Sunaina and Sona. Suniana makes a confession that leaves the family divided. Kanhaiya decides to leave the house. Will Sunaina let him leave? Kanhiaya is faced with a predicament that leaves him questioning his past. Sona goes back to Chitrashi’s house to ask about the suspicious picture she saw. It appears that Chitrashi’s family are hiding something from Sona and Kanhaiya. Things fall apart when Kanhaiya sees his childhood picture at Chitrashi’s house. Kanhaiya finds out that a big part of his life has been a lie. Siddeshwar puts up an act before Sona and Kanhaiya. Sona’s life is in danger as someone tries to end her life, who could it be? Sona goes back to investigate the spot where the railing broke off. It turns out that Chitrashi isn't as innocent as she looks. The search is on to find the person responsible for the incident. Chitrashi stops Kanhaiya from eating the poisoned sweet. Chitrashi causes the family to turn against Sona. It looks like Chitrashi is succeeding at eliminating her obstacle. Despite Chitrashi’s attempts, Sona and Kanhiaya’s relationship keeps strong. Sona suggests than Chitrashi gets married but the family misunderstand her intentions. Sona finds evidence that proves that Chitrashi is up to no good. She immediately tries to warn Kanhaiya about Chitrashi’s evil intentions. The romantic night that Sona planned for Kanhiaya turns Sour when Chitrashi takes a drastic step to ruin Sona's reputation. Kanhaiya stands up for Sona when Siddeshwar tries to exclude her from family rituals. Sona gets proof against Chitrashi but Kanhaiya is oblivious to the possibility of her being evil. Chitrashi goes to the extreme to ruin Sona's reputation. Kanhaiya turns his back on Sona and agrees with the family to throw her out the house. Sona prepares herself to leave the house, but just before she does, Sunaina arrives at their door step. Chitrashi keeps catching Kanhiaya and Sona being intimate with each other. This adds to her anger as her plans to keep them apart always fail. A man reveals that he has been in a relationship with Chitrasi. The table turns when the man blames Sona for everything he said about Chitrasi. Once again, Chitrasi throws Sona with a challenge that leaves her cornered. Will their marriage withstand all these challenges? The truth behind Sona's death is revealed. Will Sunaina be able to keep the truth from everyone? Sona puts her plan against Chitrasi in action. Chitrasi tries all means to keep the secret about Sona from everyone but fails. Chitrashi tries convincing the family that Sona is haunting her but gets caught in her own lies. Sona's plan to reveal Chitrashi's true colours is revealed. Sona’s journey to redefining a housewife might have been a rollercoaster, but, it has brought a change in her family. 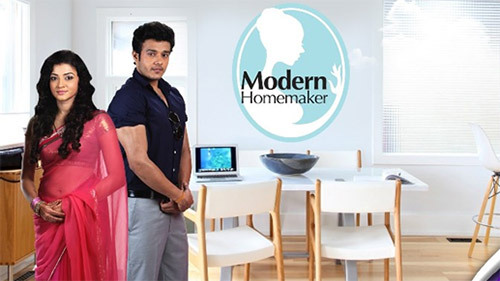 Premiere episodes of Modern Homemaker air on Zee World from Mondays to Sundays at 20h00.